We’ve been hard at work for the past two months, and we now have a lively new production for your viewing pleasure. Written and Directed by Will Hollis Snider, Messenger No. 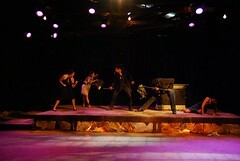 4 or How to Survive a Greek Tragedy opens Friday, February 17th at The Blue Theatre (916 Springdale Rd). 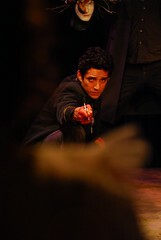 Propelled by an award-winning ensemble portraying over 50 characters from the Greek classics and Shakespeare’s masterpieces featuring Jessica Allen, Karina Dominguez, Camille Latour, Vanessa Marroquin, Joey Melcher, Megan Minto, Daniel Sawtelle, Elena Weinberg, Rachel Wiese and Andrew Rodgers in the title role. THE STORY: Messenger No. 4 longs for something grander than message delivery, so one day he takes it upon himself to SHOW and not TELL. While fiddling with messenger speeches leads to streamlined plot points and dynamic scenes, it also unfortunately leads to the accidental erasure of history’s greatest plays and –quite possibly–reality itself. Complete with sword fights, alternate universes, and an epic dance break, Messenger No. 4 is a high energy tour of love, fate and the Western Cannon. Hi! Welcome to Cambiare Productions!